Democrat Lauren Underwood got a lot of attention when she upset incumbent Randy Hultgren to take the seat in Illinois’ 14th Congressional District. She became the youngest African-American woman elected to Congress. And she won with a progressive platform in what was considered a heavily Republican district. In this week's Friday Forum, we hear Underwood’s thoughts on her new job. Congresswoman Lauren Underwood embraces her role as a symbol and example for young people to emulate, especially young women of color. But, she said, she was elected to get things done. She was sworn in to her new post in the U.S. House in the middle of a government shutdown. It therefore was an immediate priority to join the push to approve spending bills that would fund federal operations. Underwood said she heard a from a variety of people across the district affected by the shutdown. "Whether it's local farmers, whether it's food banks [or] food pantries that have had their funding lapse as a result of the shutdown," she said. "[Or] individual business owners, folks who have applied for loans or assistance from Small Business Administration." Underwood said those bearing the brunt of the shutdown include almost 100 air traffic controllers in her district who are deemed essential employees, but are not being paid. This shows, she said, that something traditionally seen as a "Washington problem" has a tremendous local impact. "So I've been focused on doing my part to represent the families all across northern Illinois who are demanding that we have a fully functional government that is open and serving the American people,” she said. It hasn’t been completely about the shutdown. She said she was proud to contribute to a couple of other bills in her first days in the House. Both, she said, are significant, beginning with the "For the People Act." “Which is a sweeping set of government reform bills," she said. "Pro-democracy reform that, you know, gets money out of politics and ends the corrosive nature and corruption really in our political system that has drowned out the voices of the voter." She's also co-sponsor of a bill mandating universal background checks for gun purchases. She says passing it is imperative. "We have a gun violence epidemic in this country," she said. "And it's not just mass shootings, but individuals. I think it's 96 people in this country die every day as a result of gun violence. Hundreds, hundreds more wounded. And we have a really fragmented system filled with loopholes." Underwood said the bill is a start toward plugging those loopholes, and a better system that will keep communities safe. 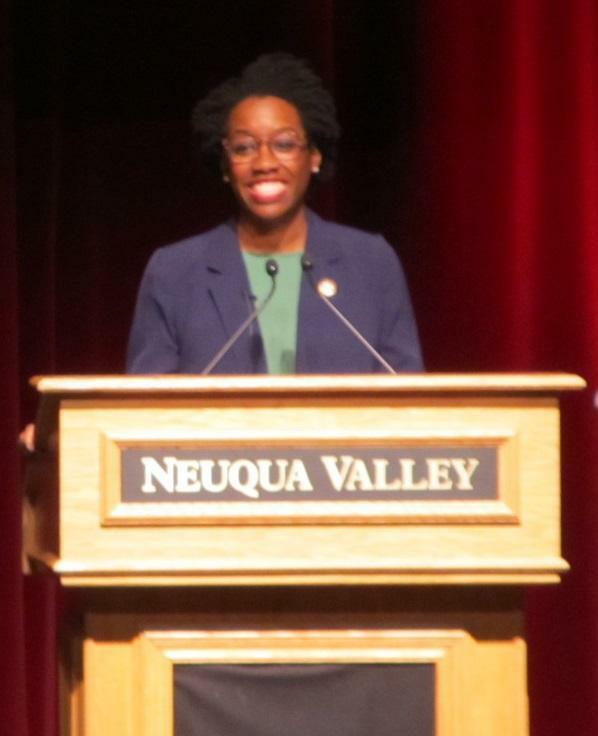 Rep. Lauren Underwood (IL-14) addresses constituents during a ceremonial swearing in. Looking beyond that, Underwood aims to continue on the agenda she campaigned on, starting with healthcare. She said she kept hearing from people worried about premiums or prescription drugs being too expensive. She brought up an example she’d given to an audience at her ceremonial swearing-in. "I shared about the mom in Oswego," she said. "She's a dental hygienist working hard to support her family --and to have to make a choice between heat and healthcare. She told her son she needed healthcare, they needed healthcare, and that the house is going to have to be a little bit colder this winter." Underwood said the government needs to make sure that doesn't continue in this country. And she will push for other parts of that agenda, too. She said public education is critically important. She graduated from Neuqua Valley High School in Naperville, a well-funded institution with many options for its students. She described herself as a proud graduate of this public school. She said, "And I truly believe that every American child should have the opportunity to have a quality education that I received." Underwood's list includes issues such as paid family leave, affordable childcare, and equal pay. It also includes election security, and the need for comprehensive immigration reform. As a nurse, she wants to continue work she began during the Obama administration. Polarization is a byword in Washington these days. Underwood said there are issues that can and should be bipartisan. “Funding risk adjustment programs that allow insurance companies to be made whole if they end up with all cancer patients, for example, that is not a partisan endeavor," she said. "And if we can all come together and acknowledge that the American people need healthcare, which again, is not a partisan issue, I think there'll be opportunities to find partners on the Republican side." Underwood also cited the universal background check bill - something she said was supported by 97% of Americans, including Republicans - as having bipartisan support. She thinks that a good starting point. Underwood said, despite her strong views, she’s mindful of her position as U.S. Representative for Illinois' 14th District. “My commitment is to serve the people of the 14th - who are not a monolith," she said. "And so my job is to represent them, not to lead with my own personal agenda. And so things that I'm working on other things that I've heard from people are their priorities." She pointed to the issue of "the wall" as an example. In the meantime, she's going to be very busy. President Donald Trump rallied Republicans in southern Illinois over the weekend. This week, a prominent Democrat returned the favor. Former U.S. Vice President Joe Biden made a stop in St. Charles on Wednesday to drum up support for 14th congressional candidate Lauren Underwood. She faces Republican incumbent Randy Hultgren.